Will America’s most affordable EV 2014 Mitsubishi i-MiEV be a hit? 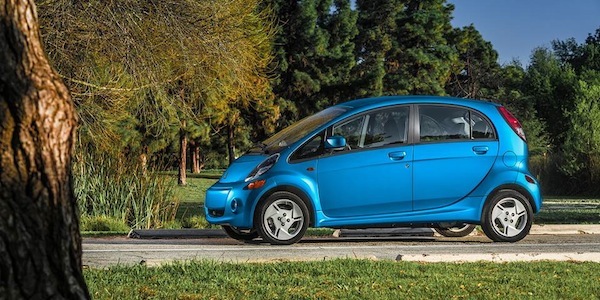 The 2014 Mitsubishi i-MiEV electric-powered vehicle gets a new low price of $22,995. What makes it even more attractive for consumers? Will America’s most affordable EV, the all-new 2014 Mitsubishi i-MiEV be a hit here in the U.S. market? It comes with a lower price than the outgoing model, and has a starting MSRP of $22,995 (plus $850 destination), which is a $6,130 price reduction from the previous vehicle model year. Mitsubishi is moving their entire lineup in a different direction and is focusing on their EV technology. The i-MiEV shows how committed they are to producing a competitive EV. What does the 2014 Mitsubishi i-MiEV come with? The compact EV comes with a number of new standard features for $22,995. It now comes standard with a CHAdeMO DC quick charge port. Mitsubishi says it will take approximately 30 minutes or less charge time from near empty to 80% full. It also comes standard with driver and front passenger heated seats, battery warming system and heated side view mirrors. It also features a 8 amp/12 amp switchable Level 1 charging cable (approximate charge time from near empty to fully charged - 22 hours for 8 amp/14 hours for 12 amp), charge port lamp and rear door speakers. The interior has been enhanced with new leather-covered steering wheel and shift knob, passenger-side vanity mirror with lid and numerous decorative color/trim upgrades. On the outside, 2014 i-MiEV comes standard with aluminum wheels, front fog lights, daytime running lights (DRLs) and black-out door sash trim. All 2014 Mitsubishi i-MiEVs also come with Electric Power Steering (EPS) and regenerative braking system; i-MiEV remote system for programming pre-activated air conditioning, heating, and timer charging of the main drive lithium-ion battery pack; halogen projection headlights with auto on/off headlight control; rear LED combination taillights; efficient electric air conditioning with pollen filter and electric cabin heater; and a 100-watt 6 speaker AM/FM/CD/MP3-compatible audio system. With the efficient MiEV-based electric motor and transmission, the 2014 Mitsubishi i-MiEV has an EPA-rated "fuel" mileage rating of 126 MPGe (mile-per-gallon equivalency) in city driving/99 MPGe on the highway/112 MPGe combined. The 2014 Mitsubishi i-MiEV isn’t just about saving the planet, it’s also about saving consumers dollars. Mitsubishi i-MiEV arrives this spring here in the U.S. with lots of standard equipment and it’s the most affordable electric vehicle in America. It looks like Mitsubishi is making a strong statement with the all-new i-MiEV priced at $22,995 plus destination. Other 2014 Mitsubishi i-MiEV stories of interest.